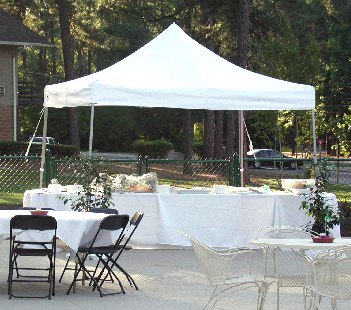 This instant canopy is heavy duty and has a sturdy aluminum frame. The canopy measures 10 feet wide and 10 feet long. The top is a stand out white color. This canopy is noted for its toughness. This White Goliath Heavy-Duty All-Aluminum Instant Canopy is made by King Canopy. The frame will not corrode. This canopy is very stable and well supported. The legs are two inches in diameter. The canopy has a one year prorated warranty. Do the walls attach with Velcro or clips? Sidewalls are attached to the frame with velcro loops. I wanted to know if the legs, or tubes are square or round. Can I get a RED top? No, this canopy comes with a white top only. If you wish to get a red top, we would suggest one of our Caravan brand canopies as these give you the option of choosing a red top. Finally a pop up shade tent that isn't a piece of junk. Well built with quality materials. Worth the extra money for sure. We really enjoy our canopy. You can't buy good ones like this in stores. I liked this so much, I had to buy two of them. It is really sturdy and heavy, but in a good way. Seriously, you need some real muscle to set this up. It is larger than it appears, too. I?m not sure how it compares to others, but I have been really satisfied with this one. This has great price and quality. It has been very easy to set it up and to take it down. The 2 inch frame helps it to be very sturdy. Nothing else has come close to being this good for the money. I really liked how sturdy this canopy was. I thought it would be good in all kinds of weather conditions, but we recently had it up in a rainstorm and even though the frame seemed sturdy, it still buckled under the weight from the rainstorm. This is not a good canopy if you have it out in the rain, it is only good to shelter you from the sun. It did look great on our deck, though! I really like the Goliath King Canopy I recently purchased. The one I bought has four sidewalls and weight bags that make it sturdier. I can say that one of the benefits is that this has been very sturdy so far. There are some problems to address with the canopy. One is that the instructions are very hard to follow and were poorly written. While putting this together, I had to keep taking things back off to get things correct. Also, the canopy allows water to pull up, so I had to use some pvc pipe to fix the problem. It works like a charm now, but I would expect a little more from such a pricey canopy. I like the sturdiness this canopy provides! It is so big and heavy, it might take several people to move it around and set it up. That is a good thing, though, as it means it won?t be flying away when a little breeze kicks up. I would definitely buy this canopy again! I am really pleased with it. I love the shade this canopy makes for us on our deck. It is really sturdy and is just what we?ve been looking for. I was disappointed in the top and walls on this canopy. I wanted to use this at a show where I didn?t want my display pieces ruined, but when it rained, that?s exactly what happened. On the plus side, the frame was very sturdy. I only wish the canopy would withstand a little more moisture. I was told by King Canopy that the canopy was only designed to use to provide shade from the sun, but you would think that if it claims to be water resistant that it would be able to hold up under a little bit of moisture. They did recommend a seam sealer, but that seems like too much of a hassle for what I am using it for. I bought this canopy to use in an art market, but I really can?t recommend it for that use. Even though it is water resistant, it doesn?t do well in the rain at all. King Canopy told me I have to use a seam sealer if I want it to be more water tight, but that does not help me at the art fair. I need to make sure what I have stays dry and I?m not sure if it will do any better with the seam sealer. It might be good if you just need some shade, but watch out when the water comes! I really appreciated the sturdiness of this canopy. I have not tried many others, but this was good enough that I bought a second one. It is really sturdy and heavy. It is so heavy that I really wouldn't suggest trying to set it up by yourself. You really need a little help with this canopy. This canopy seemed to have it all for us. We really liked the sturdiness of the frame and the design seemed really nice. Unfortunately, we left it out in the rain and it was totally ruined. The beams buckled and one broke in half. One of the legs was bent badly. We didn't realize before, but we know now that this is definitely not good to withstand the rain.